This post was originally published on November 11, 2010. It was substantially revised and re-posted on May 11, 2015. Looking for a boy’s name that is fierce – and yet wearable, too? 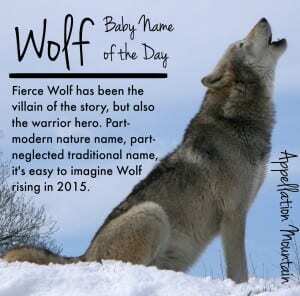 Thanks to Taylor for suggesting Wolf as our Baby Name of the Day. Wolf comes directly from the Old English wolf. In Latin, the animal is lupus. Wolves have long been feared by villagers and chased off by farmers. They’re the villain of fairytales and folk stories, from The Three Little Pigs to Peter and the Wolf to The Boy Who Cried … well, you get the idea. They figure prominently in legend and myth. Romulus and Remus, the future founders of Rome, were raised by a she-wolf. The Norse god Odin kept two as pets, but Loki’s son Fenrir was a monstrous one. In some cultures, they’re destruction on four legs. In others, their fearlessness is admired. Christianity sometimes equates wolves with the devil, but Saint Francis tamed one in an Italian village. And then there are the werewolves, a concept dating to the 1400s and continuing right through Twilight and True Blood. Fierce creatures often influence personal names, because we appreciate their strength and courage. Just like there are plenty of Leo names, we can find names like Wolfgang, Cynewulf, Ranulf, and Beowulf over the centuries. Surnames like Lowell and Lovett also refer to the animal. The Hebrew name Ze’ev or Zev is yet another wolf name, and has seen some use in modern Israel. It appears that Wolf started out as a nickname at least some of the time. This family tree includes men answering to Lupellus – little wolf – and Lupus as well as the surname de Lovel. But many of those given names have long histories of their won. Wolfgang is probably the most familiar form of the name, thanks to notables like Mozart and Goethe. It was a nickname for author Jack London. In his 1904 novel The Sea-Wolf, it’s the first name of Captain Larsen – though he’s no hero. London also bought land in California’s Sonoma Valley, and spent years building his dream home, Wolf House, only to see it burn to the ground before his family could move in. The ruins are part of Jack London State Historic Park. CNN journalist Wolf Blitzer, born in Germany to Jewish Holocaust survivors. It’s a family name, shared with his grandfather. Celebrity chef Wolfgang Puck was born in Austria, and is now a household name. Rocker Eddie Van Halen and actress Valerie Bertinelli named their son after Amadeus, and now Wolfgang plays bass for dad’s band. The design-savvy Novogratz family of 9 used the name for their eldest and put it squarely on the style map, along with Tallulah, Bellamy, Breaker, Five, Holleder, and Major. Kimora Lee recently welcomed a son named Wolfe, a little brother for Aoki, Ming, and Kenzo. There’s something fierce about Wolf, and yet this one feels quite wearable – maybe surprisingly so. Parents have embraced nature names, including other creature names, from Colt to Fox to Wren. 93 new boys named Wolfgang, up from 64 in 2013. 47 named Wolf, down slightly from 2013’s count of 51. The ‘e’ spelling was given to 14 boys in 2014, up from 11 in 2013. Plus 5 boys called Wolfram in 2014. 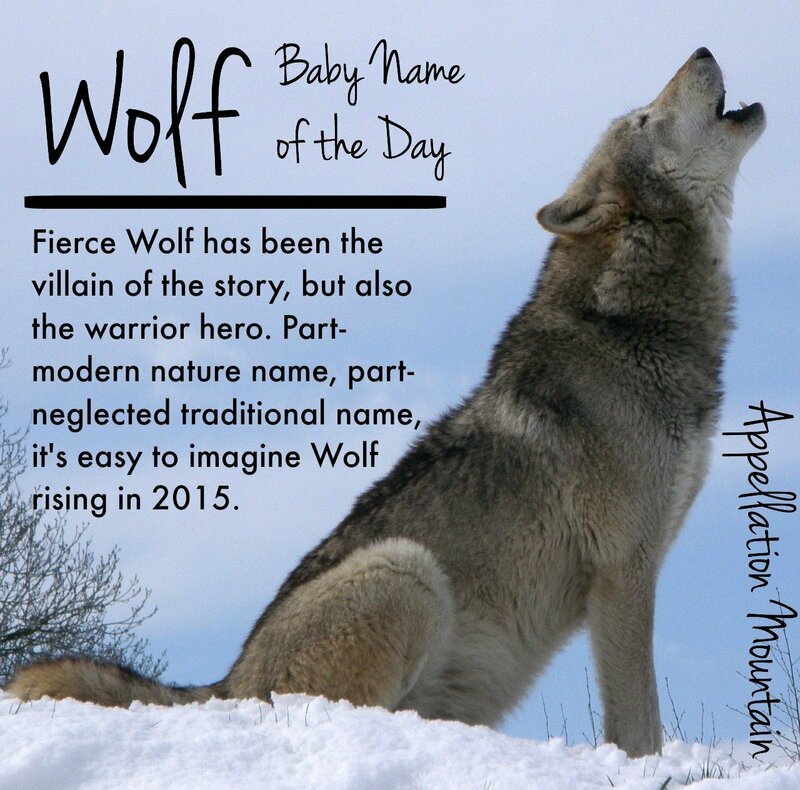 With ties to traditional names used over the centuries, no wonder Wolf feels like an undiscovered gem. And while Wolf and company remain under-the-radar, there are signs that these names may not remain rare for long. I read from site that mentioned a little girl named SeaFlower after being born while her father was away on ship. The flower part of her name was after her still born sister that came many years prior. 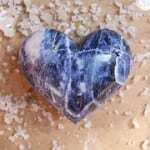 I thought is was sweet. It made me think of that after mentioned Sea-Wolf. I love Wolf/Wolfe and have been a big fan of all the wolf names. My favorites are Adolf, Cynewulf, Agilulf, Ralf or Rolph or Rolf, Rudolph, Wolfstan or Wolston, and Ulrike or Ulricke. Many are family names. I think there is something viril and strong about these older names. I respect the idea of having a name that is all masculine with representations of chivalry, honor, and strength. I feel that many boys’ names lose this element when given to girls. We are expecting our first boy in early May and while I wasn’t a fan of the name Wolfe before being pregnant….now I adore it! I think our little boy is trying to tell me something lol. We have a Wolford in the family so my side of the family is very comfortable with Wolfe. 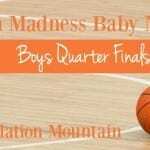 I like Wolfe Grayson for his first and middle. We are big fans of individualistic names. Wolfe Grayson’s sister’s name is Xiola Mae. We’re so excited! What a wonderful tribute to family. We have many wolf elements in our family from Adolf, Ulrick, to Wolfstan/Wolston. I am personally in favor of the wolf name Agilulf, many because it is a bit more medieval and lesser heard. Best wishes to you! We are expecting boy #3 in March and Wolf has been my choice, and since it’s a boy I got to pick! His full name will be Wolf William. Siblings are John Ronan (goes by Ronan), Isla Audrey and Stellan Michael. I always thought Wolfie would be the sweetest name for a little one and Wolf sounds strong to me. Congratulations on your baby-on-the-way! Wolf William is a great name. I named my son Wolf just over a year ago. I love the name and always thought of is as a strong name. I want to raise a strong man so I felt the name was fitting. That aside, everyone that meets Wolfie thinks he is super cool. He is very popular eventhough he’s only 14 months old! At first, family and friends did not embrace the name. Now, everyone thinks he is the coolest kid. Hi there! Thanks so much for your input. Just found out we are having a baby boy in September and the name Wolf is at the top of our list. Wolfie could not be more of a sweet nickname 🙂 However we are having trouble deciding on a middle name… nothing seems to fit quite right. Did you have any difficulty? Just for reference, our first son’s first and middle name is Lennon Night. Thank you for your help! re: Gunnar – this is a traditional name meaning warrior, not related to “Gunner”. It’s closer to the German Gunther. Ah, this is one of those moments. Kaitlyn is more popular, but Caitlin is much closer to the original. Turns out that Gunnar, while more faithful to the original name, is less popular than Gunner in the US. (#540 for the “a” spelling in 2009; #471 for the nouveau “e”.) I never know what to do in these cases. It’s legitimate to respell a name to make it more easily pronounced in a different language. Happens all the time. I agree that Gunner looks misspelled and rather unsophisticated, but he’s catching on. Wolf Blitzer comes to mind first. I like it though. I would not have the confidence to use it for a kid of mine (up front that is), but I do sometimes wonder if we should’ve used the similar Fox in the middle for Oliver… it has some crazy weird connection to how I ended up meeting my husband (it has meaning for me/my side of how it happened, but not really for him, which is why, when I suggested it, it fell flat for him)… so we did the right thing, but I sometimes think Fox would have made a somewhat more interesting mn. Back to Wolf. I can definitely see using it in the middle. Up front, it’s for the brave and ballsy namers. And, you’ve mentioned naming for one’s alma mater previously… with the NC State “Wolfpack” right around the corner from me, maybe some of them would love to call their kid Wolf? I can’t see this one becoming a top 100 name, though – this one seems firmly on the rare end of the scale. And there’s also Jack London’s character, Wolf Larsen, from The Sea-Wolf. Totally overlooked him. Apparently there’s a Canadian actor named Wolf Larson, too – he was born Wolfgang. Mark would be over the moon if I agreed to Wolfgang as the boy’s name for this next baby. However, I have already conceded my favourite girl’s name in favour of a name of his selection, and since I find Wolfie just a little too much for my taste, I’ve resisted giving in so far. In Germany, the “Wolf-” names are considered a bit grandpa-ish, most men with the names are probably around Wolf Blitzer’s age. I’m surprised you didn’t mention the American journalist Wolf Blitzer – I would think he’s the best known Wolf of our times. I can see the vampire-werewolf craze leading to the birth of some little Wolfs (Wolves?). Loup (French for Wolf – the p is silent) is occasionally used as a first name, and there is even a Quebec actress with the somewhat corny name of Mariloup Wolfe. I am now banging my head against the kitchen counter. HOW could I overlook Wolf Blitzer? He takes the name out of the uber-masculine overkill category into the perfectly reasonable. I really like Wolf and Wolfgang, the nickname Wolfie is very cute I think. I also think Wolfram is pretty cool which is also German meaning “Wolf raven”. My father’s name happens to be Lowell…Lowell middle name Venice. I find Wolf somehow more appealing than names like Fox or Bear, perhaps because of the Wolfgang connection. It’s not like there’s a more formal Fox or Bear name (that I can recall off the top of my head). It probably also helps that my friend’s dad is Wolf (a giant first-gen German who is gentle but big and strong – all Wolf), so the familiarity makes it seem not as, dare I say silly/outlandish, as something like Fox. I’ve lived in and near Oklahoma for much of my life. Wolf sounds Native American to me, in a good way. Ditto for Crow, Eagle, Bear, etc. I had a friend in high school named Wulfrano, we called him Wulf (Wolf). My sister’s dad’s last name is Wolfe and so is hers. So its interesting, but too strong of a first name for me. Wolf certainly does sound distinctly male / manly. And I do prefer the ‘animal manly’ name, over the more ‘violent’ sounding Cannon and Gunner. At least with Wolf you have a furry animal image. I immediately think of the Gladiator by that name. I looked it up and I see that both UK and US versions had a “Wolf”. The UK website I found had Wolf described as the “bad guy” but also as the most popular. It might feel a bit strange to read the traditional fairy tales with “the big bad wolf” to a son named Wolf. Like he might wonder why the wolf is always the bad guy. I guess you could avoid those though. Wolf is a great, ultra masculine name. I would choose something like Wolf or Fox or Leo if my last name wasn’t a noun also. It would make a great 1 syllable middle name instead of a common “filler” middle name. Oh! How timely for me that you write of this. I’m pregnant with my second child, and for a boy we are considering Lowell for the MN or perhaps FN. It is a family name on my husband’s side–a great uncle Lowell, his father’s MN is Lowell. How do you feel this name stands today? Does it feel too musty? Our daughter’s name is Ellery, if this gives perspective. Thanks for any thoughts, folks! FWIW I love those names together!!!! They match perfectly! My mother is from a German family. She dated a boy named Wolfgang Wolf in high school – Wolfie Wolf is what he went by. I think even without “gang” on the end, it sounds very German to me.